Today kicks off the 2009 National Cherry Blossom Festival. Two weeks of performances along with a parade and a street festival all celebrate the beauty and history of the District's Yoshino Cherry trees. The NCBF runs from Saturday, March 28 until Sunday, April 12, 2009. Casey Trees is joining the celebration and offering a special talk focused on the popular tree. 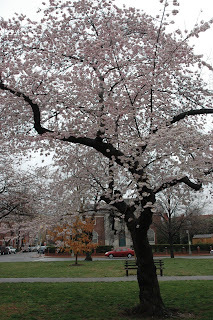 Cherry Blossoms and Elms led by National Park Service horticulturist Rob DeFeo will take place on May 5, 2009 from 6:30 p.m.-9:00 p.m. Mr. DeFeo is one of the most quoted individuals in DC because he is an expert on predicting when the trees will be in peak bloom.